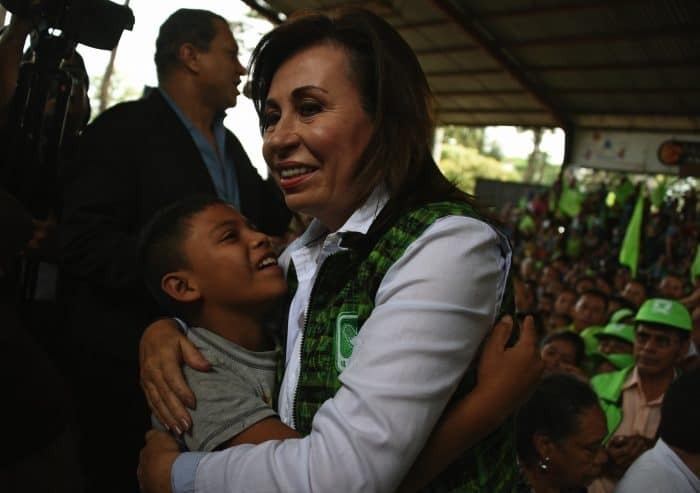 GUATEMALA CITY — After a campaign upended by a massive corruption scandal that felled the former president, Guatemala elects his replacement Sunday in a run-off between a politically inexperienced comedian and a former first lady. 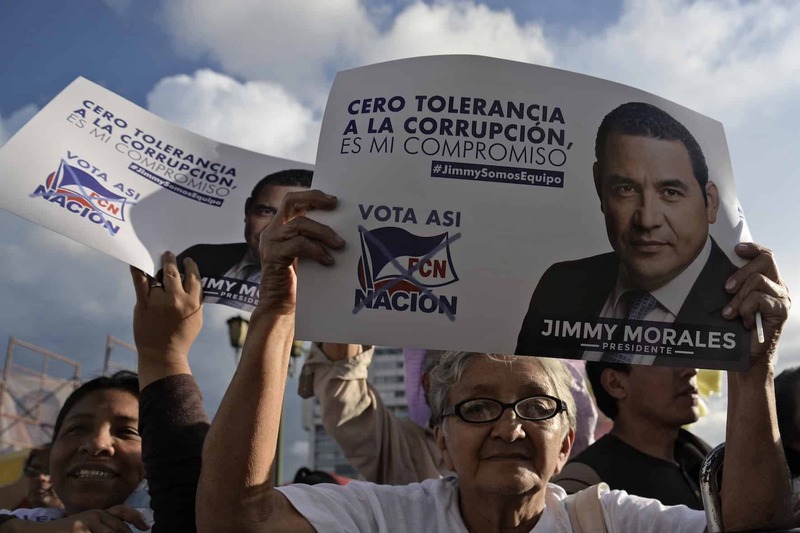 Comic and TV personality Jimmy Morales is the massive favorite despite never having held office at any level — currently seen as a plus in this impoverished Central American country fed up with revelations of political fat cats stealing public money. His opponent is Sandra Torres, the ex-wife of former president Álvaro Colom (2008-2011), who will become the country’s first woman president if she manages to pull off an upset. The final poll before the election gave 68 percent of the vote to Morales, who is running for conservative party FCN-Nacion, and 32 percent to Torres, the candidate of social democratic party UNE. In the crowded first-round election on September 6, Morales took 24 percent to 20 percent for Torres. Morales, 46, began the campaign as a long shot, but surged to a surprise lead in a race rocked by president Otto Pérez Molina’s resignation and arrest on corruption charges three days before the first-round vote. Pérez Molina, who is now in jail awaiting trial, is accused of running a scam in which corrupt customs officials gave businesses illegal discounts on their import duties in exchange for bribes. The scheme — dubbed “La Linea” (the line), for a hotline businesses called to access the corrupt network — collected $3.8 million in bribes between May 2014 and April 2015, including $800,000 each to Perez and jailed ex-vice president Roxana Baldetti, say prosecutors and United Nations investigators. It was the latest in a string of graft scandals in a country where corruption accounts for 50 percent of political parties’ funding and some $500 million in state funds goes missing every year, according to the Central American Institute for Fiscal Studies. Since Pérez Molina’s downfall, the country has been in the hands of Alejandro Maldonado, a former Constitutional Court judge who will serve until Sunday’s winner is inaugurated on January 14. Jimmy Morales rose to fame playing the role of a simpleton cowboy who almost ends up becoming president. In what some have called a case of life imitating art, the political outsider won the September 6 first-round election with 24 percent of the vote — after starting the campaign with just 0.5 percent support in April. He now looks set to follow through on that surprise victory. Running for conservative party FCN-Nacion, Morales has led a light-hearted campaign, cracking jokes at rallies but giving few concrete details on his policy plans. “For 20 years, I’ve made you laugh. I promise that if I become president, I won’t make you cry,” he reassured voters. In his 2007 film “A President in a Sombrero,” Morales played a hayseed named Neto who nearly gets elected president by making a string of empty promises, but ends up dropping out of the race and returning to his hometown. In real life, the current race is his first foray into national politics, though he once ran unsuccessfully for mayor of his hometown. Morales briefly studied management at university, but never finished his degree. While he is uncontroversial, his party is not: It was founded in 2008 by former military officers accused of committing human rights violations during Guatemala‘s civil war (1960-1996), which killed some 200,000 people. Morales, who hosts a comedy show on TV and also produces movies, is married with four children. Sandra Torres, the 60-year-old ex-wife of former president Álvaro Colom (2008-2011), divorced her husband to be eligible for the 2011 election, only to have her candidacy rejected by the Electoral Tribunal on grounds that she was still a close relation of the incumbent. Her hopes are now pinned on her poor rural base to deliver an upset Sunday. She won 20 percent in the first-round vote, which ended in a down-to-the-wire race for runner-up. After 10 days of counting and recounting, election officials finally announced Torres had edged out millionaire businessman Manuel Baldizón, the man who many saw as Guatemala‘s next president until the recent corruption scandals, which also tainted his conservative party. As head of the government’s social programs during her husband’s administration, she was considered a powerful and uncompromising figure, but she has sought to present a softer side on the campaign trail. An outspoken activist for women’s and children’s rights, she has no children of her own. Guatemala is still recovering from its 36-year civil war, and 53.7 percent of the population lives in poverty. It also suffers under the scourge of powerful street gangs blamed for giving it one of the highest murder rates in the world. Guatemala, a country of 15.8 million people, has 7.5 million registered voters. Polls open at 7:00 a.m. local time and close at 6:00 p.m., with the first results expected after 9:00 p.m.